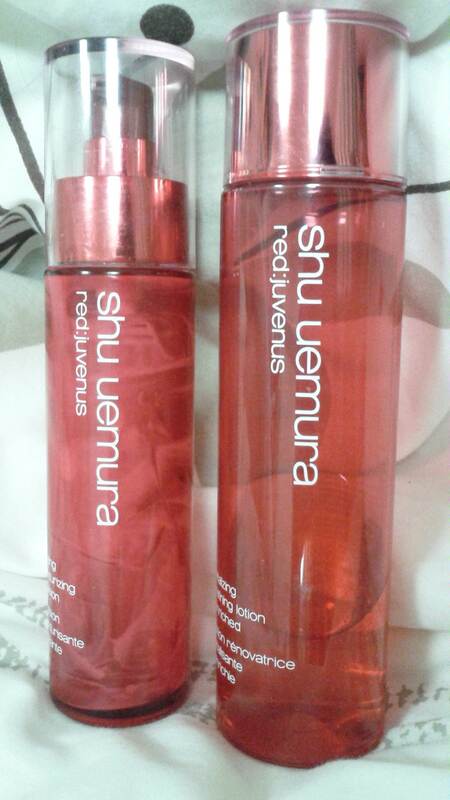 Many of you reading my blog may know that I am an avowed Shu Uemura fan. If it’s by Shu, I’ll be the first one out of the starting blocks. The number of times I’ve gone up to the counter and gazed at all of the products adoringly while the sales assistants look on with concern, is quite frankly embarrassing. I’ve been using the “Vitalizing Refining Lotion Enriched” and the “Vitalizing Retexturising Emulsion” from the Red:Juvenus range for the past few months and thought I would give you my thoughts on it. My skin may definitely have looked radiant and felt more elastic, but whether that’s down to this lotion or just putting some kind of hydration onto my dry and sensitive skin, parched after washing, is another matter altogether. This enriched lotion is gloopier and thicker than the other lotions I’ve used by Shu (the blue Hydrability range) and the scent is stronger. I actually like the smell a lot, but I think it could bother people who don’t like strong scents or gloopy lotions. Did I experience any of this? As far as I’m aware – no. I didn’t use any other products from the Red:Juvenus range, only these two. I really haven’t had the best skin over the past few months, and while I’m always battling blemishes and my skin goes haywire over the summer months (here especially) anyway, I’m pretty sure it wasn’t this bad last year. I don’t want to point the finger at this and name this the culprit when I can’t be 100% sure, but I have my suspicious that it has played a significant role (along with weather and diet) in that. Perhaps it’s the strong fragrance that disagrees with my skin, or perhaps the enriched lotion is just too enriched, or perhaps my skin has a problem with being “retexturized,” I don’t know. But what I do know is that I won’t be purchasing this again. For products this expensive, I’d really expect them to do a little more and not make my skin angry at me. I used the blue Hydrability range throughout the last winter, and never had these kinds of problems. Obviously, every person’s skin is different, and this may work for you – consider yourself a lucky duck – but it just wasn’t for me. If you’ve had happy ending with this product, I’d really love to hear all about it. I shall be changing up my skincare products soon, and if I was wrong about Red:Juvenus playing a role in my problematic skin over the past few months, I will write a blog apology post in the future. Last thing for today – since using Shu products, I’ve become accustomed to using a lotion under my moisturiser at night, and now that this one is out of commission, if you have any suggestions for serums or toners or lotions that are good for dehydrated and sensitive skin, I’d love to hear them! Hope you’re having a marvellous weekend, wherever you are! I always wanted to try some shu stuff, I’ll have to order online. I love getting my cosmetics in the store, where I can see and try them out, but I haven’t seen this brand in my city. I like their stuff usually, but this line just didn’t agree with me.